HANGZHOU: Chinese automaker Zhejiang Geely Holding Group Co Ltd (Geely), which controls a 49.9% equity stake in Proton Holdings Bhd, is keeping its promise to bring Proton cars to China, where annual passenger car sales hit 24 million units last year. Proton and Geely have signed a heads of agreement to form a joint venture (JV) for Proton to assemble and market cars in China. Proton will set up manufacturing facilities in China to execute the plan. According to the statement released to Malaysian media on Saturday, the portfolio of cars for China will primarily come from existing Geely platforms, although the external design of the vehicles will be undertaken by Proton. However, the agreement also provides for existing Proton platforms that are found suitable to be developed into models for the Chinese market. Prime Minister Tun Dr Mahathir Mohamad, who is currently on an official visit to China, witnessed the signing ceremony here on Saturday. Geely chairman Li Shufu and Geely Auto Group president and chief executive officer An Conghui were present as well. 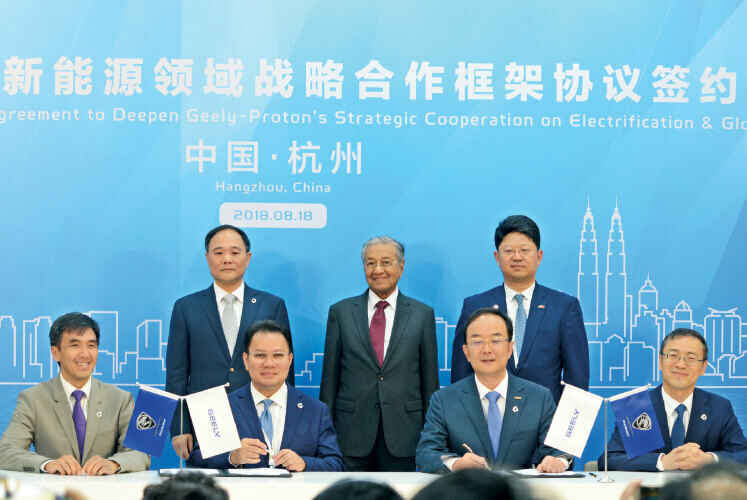 Proton chairman Datuk Seri Syed Faisal Albar Syed Ali Rethza Albar, who signed the agreement, acknowledged that Geely as a strategic stakeholder would help to pave an easier route for Proton to penetrate the sizeable Chinese market. However, the sum of investment in the new plant in China is not yet known as the two parties still need to conduct detailed studies on it. “Clearly, with Geely on board, Proton’s route into China has become more tenable. Part of Geely’s role is to secure the manufacturing licenses and regulatory approvals required for such a venture under China’s regulations. Geely will also identify a suitable location where the manufacturing facility will be based in,” said Syed Faisal, who is also the managing director of DRB-Hicom Bhd. Geely noted that since the Chinese carmaker acquired its stake in Proton, the latter had seen an improvement in sales that reached a 30-month record in July 2018. In the fourth quarter of this year, Proton will launch its first jointly developed sport utility vehicle to strengthen its position in the home market and Asean. Geely’s Li said the heads of agreement signed on Saturday is an extension of the existing partnership that the group had established with DRB-Hicom. “This new framework will help us to embark on the next stage of development of Proton cars, and to assist the brand in achieving its full potential in Malaysia and Asean as well as globally by utilising new energy technologies and boosting the core competency of the Malaysian automotive industry,” said Li. The Chinese passenger car market has grown rapidly in the past 10 years, from 6.76 million units sold in 2008 to 24 million in 2017. Geely sold more than 1.24 million last year, representing a 5.06% market share.